Our local toddler preschool is for 12- to 24-month-old children. At Lil’ Rascals Academy, we don’t believe fun and education need to be disparate items. 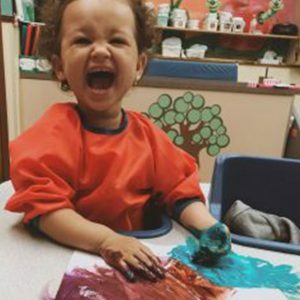 Instead, our preschool center combines the two for a unique preschool experience — all of our preschool activities aim to help your child grow and progress in a fun way. We have preschools in Cooper City, Davie, Pembroke Pines, and Weston, and we’d love to have your child learn and grow with us. Schedule a free tour of our preschool today. Why choose Lil’ Rascals Academy as the preschool for your toddler? Our toddler preschool has a primary focus on visual stimulation to help your child communicate, even if they can’t quite use their words. Social interaction at this age is essential for your child’s growth, and our preschool offers a unique group setting with classmates and teachers. All of our preschool teachers are attentive, trained, and qualified to help your child develop cognitively and emotionally. We have four locations in Broward County, all with bright, clean, sunny rooms full of preschool activities. We offer a free tour to prospective parents! Schedule your tour of our preschool daycare today. The transition to the Toddler room is very exciting! Your child has developed a distinct personality and is learning the skills to follow a group setting and trust new staff members. At this stage, children are learning to communicate, but not always through words. So we work on visual stimulation using colors and shapes; sorting objects, mixing colors and encouraging manipulative play to further their understanding of the world around them. The growth at this age is evident on a daily basis and is very encouraging for the child and their teacher. Talk to us today about our unique preschool in Davie, Cooper City, Pembroke Pines and Weston.